Beginning from literature, ayur veda [medical sciences] to music and dance - India has believed and advocated the harmony between man and nature. The word, Yoga is derived from the Sanskrit root- yuj- meaning to bind, join. It also means union. Yoga asanas are poses emulating the tree, the birds and the animals and through the practice of these postures, one discovers the art of living a healthy and disease-free life. "Nature has a life of its own in Indian thought- it enshrines centers of power, radiating holiness, plenitude and beauty" says Chandra Rajan - in KALIDASA- the loom of life. Kalidasa is the greatest poet and playwright in classical Sanskrit literature and one of the greatest in world literature. Taking Kalidasa's RITUSAMHARAM [the gathering of the seasons] a poem in six cantos, in which the writer talks of the 6 Seasons, namely, Summer- Rains- Autumn- Frost- Winter - and Spring, I have co-related it to Haiku and Indian seasons. For more about the Seasons in Indian Haiku, click here. India is a tropical country - steamy and humid - sultry and unbearably in the Summer months. The Summer months gradually begins from March end – gets severe during the month of May tapering off by end June- when the whole of India talks of nothing but the impending monsoons! The month of May does bring the summer showers but it lasts for a few days and the earth seems drier and angrier than ever before. The best part of Summer is that it is the season of Mangoes – the king of fruits. Endless varieties of mangoes will be available. Kids have their two month summer vacation and . . . . . coaching camps and personality development classes will be in full swing . . .
scorching summer is now here, my love. the moon pales at dawn struck by guilty shame. The monsoon brings with it the smiles of India. India being purely an agricultural country, the timely rains are extremely important to farmers. On the Konkan coast the rains begin by June end and goes on till September beginning. Good heavy rains are witnessed in these areas. Down south – Chennai and neighbouring places get their rainfall in Oct / Nov. - mostly cyclonic rains, causing great devastation at times. Sadly when one part of India suffers deficient rains, a few states might be suffering the ravages of floods. welcome to lovers, now comes like a king, my love. now begin to dance, gorgeous plumage spread out wide. and the heart is twisted with sudden longing. Autumn in India – is not of the leaf dropping kind! Leaving summer far behind - having had good rains – Autumn brings joy and festivals into focus. Holidays and family gatherings . . . Autumn has now arrived, enchanting as a bride. fully grant your heart’s highest happiness. -approximately in November and December. The nip in the morning air . . . the biting cold in the nights . . . time for Kashmir shawls and woollen sweaters to make an appearance . . . an increased demand for skin creams and messages! Fresh fruits like the famous- Kulu apples from Kashmir, vegetables like peas and many other varieties of carrots etc – would be seen in abundance in the markets. Chennai is renowned for their December music season. When hundreds of associations called sabha, hold concerts throughout the day running through the whole month and more. thick-falling dews usher this season of frost. are sonorous with the calls of damsel cranes. Ah! What restlessness they arouse! the Priyangu now grows pale, my love. Winter is now here; hear now, my love. delight the mind at this time of the year. these nights give no comfort or joy to people. Spring strides in stealthily . . . called basant or vasant, spring has inspired many Indian artists in all art forms. We even have a Raga named after Spring in Hindustani classical music. Raga Basant- is a beautiful lilting raga, whether it is sung or played on an instrument. For children – spring is exam time! India has always given emphasis on good education and so every child almost is under pressure to perform well . . . the competition being very stiff – things are stressful for school goers. of Love’s devotees, is now approaching, my love. stung by proud Love’s flying arrows, my love? by Kimsuke blossoms bright as parrots’ beaks? by the golden champa’s brilliant blooms? She has a deep and abiding interest in classical literature and folk art. 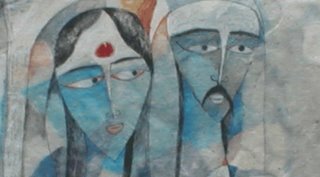 Her series of paintings inspired by Kalidasa's Raghuvansham, Ritusamharam, Kumarsambhavam and projects a sense of originality.